Any one of the 90+ national and international galleries that exhibited at the 9th annual Dallas Art Fair this past weekend will likely agree on one thing: Dallas is serious about building relationships. And of course with those good relationships comes good business. It’s that process that I’ve seen expand and sharpen over the past five years I’ve attended the event. What’s really unique about this fair extends to what is really special about Dallas and that is an accessibility that isn’t easily found within larger cities. Don’t get me wrong, I’m sure there were plenty of VIP events and high end meet ups but there were also open invite after parties where everyone from Journalists to Dallas based artists danced with international gallerists, collectors, and local graduate students. What happens outside the manageable sized fair allows for visiting galleries and artists to actually spend time in the city further connecting with Dallas as an arts destination and home to a thriving arts community. What was happening inside the fair was a scattering of phenomenal paintings throughout two floors at the F.I.G Building in Downtown Dallas. – Arthur Peña, Dallas Contributor. Count Katherine Bradford as a personal hero of mine. I met Bradford by accident in ’13 when we were both having shows in separate spaces at 56 Bogart in Brooklyn. She allowed me to go on fawning over a painting of a big boat a float at sea from a painter I had yet to encounter before informing me it was she who painted the large piece. She traded a visit with me, mid opening mind you and with an out of towner whom she just met nonetheless, and was very generous with her time and thoughts. What initially struck me about her work permeates her 2016 piece Prom Swim, Green showing at the CANADA booth. An overt generosity painted through washy forms softens the underlying precariousness of her work. 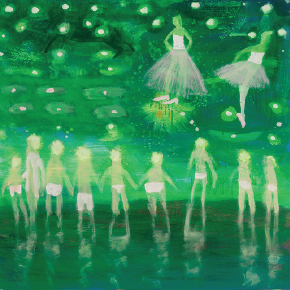 The internal glow in Prom Swim, Green flattens space and extends the reading. Bradford harnesses the speed of light to bring us to an absolute stand still. And there we are, standing with the figures, staring into space, Bradford’s loose brush work and earnest gestures bouncing us around the stars. The internal visual poetry touches on the eternal. I’m not the only one who fell in love with this piece. In its second year and double the amount this time around, the DAF in conjunction with the Dallas Museum of Art have allotted $100,000 to purchase works from the fair. Bradford was one of six artists whose work was purchased by the museum with the DMA adding Prom Swim, Green to their permanent collection. Ryan Wallace, artist and co-founder of Halsey Mckay, stated that he is “drawn to paintings that have a timelessness to them.” Johannes Vanderbeek’s work functions in between a making and unmaking as the images seemingly move and grow while trapped in hardened earth. The surfaces are dug into, layered with pigmented sections, and stoic while staring back. Wallace described the process of making the works involving drawings on plexi-glass, lots of clay, and a hot glue gun. The visual weight of the works is compounded by a mesmerizing process that reveals itself if you can look past the works reflected gaze. The booth, which was co-presented with Marinaro, was one of the best at the fair. At DC Moore Carrie Moyer’s Happy Data stopped me in my tracks and before I knew the title I let out a laugh. Moyer has stripped down this work to a few elements with a masterful visual speed. Every form, mark, and hue are doing equal lifting as they build up to the crescendo of a surprise party that you just walked into. Surprise! All in all there were plenty of solid paintings to behold and I’m sure everyone in Dallas is well on their way to recovery from the whirlwind week. Below are a few more stand out works.